Kanefield, Teri. 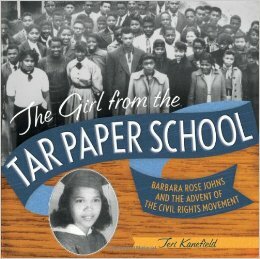 Girl from the Tar Paper School: Barbara Rose Johns and the Advent of the Civil Rights Movement. Non-fiction. Abrams, 2013. 56p. $19.95. 978-1-4197-0796-4. OUTSTANDING. GRADES 4-8.
devastating results: the local school board disbanded all public schools from 1959-1964 rather than desegregate. Clear writing illuminates both the local and national civil rights history and depicts an inspiring heroine whose youth and quiet resolve give this story particular resonance for young readers. Back matter includes index, endnotes, image credits, acknowledgments, and discussion of sources. This entry was posted in Review of the Week and tagged Teri Kanefield, The Girl from Tar Paper School. Bookmark the permalink.